To the west in the next building was a drug store and doctor's office in the rear. Adjacent is a store featuring dry goods, clothing, etc. These buildings were to be occupied by the Harris Brothers Dry Goods Store on May 22, 1885. On the second floor was the Odd Fellows Lodge. Until this building was faced with aluminum siding several years ago, the letters I.0.0.F, set into the brickwork, could be clearly seen. H.A. Evans law office also occupied space on the second floor. In the middle of the block was Pierce and Dyer Drugstore, David Rhine's Dry Goods and Newman's Saddlery. A saddle shop had occupied this space since the early 1850's. From here to the corner were a bakery, restaurant, Dave Myers Buckhorn Saloon and a building shared by Pacific Express Co. and a sewing machine store. Next was a Chinese laundry. This might explain the presence of a. Chinese coin which was sealed in the cornerstone of the courthouse in 1888. The coin is a part of the collection at the Museum. A meat market and barbershop shared the next building with A.W. Cadman's photography studio on the second floor. Anchoring the west end of the block was Paul Clendenen's grocery. North on Main Street behind Clendenen's were only a few scattered structures. Immediately behind the grocery was a beer warehouse. In the middle of the block was a carpenter's shop and English's Hotel. Next a cobbler's shop and at the corner a blacksmith shop and wagon works. Crossing North (Sixth) Street we find a dwelling and a structure which housed the medical offices of Dr. J.S. Saunders and his son Dr. Bacon Saunders. A bit of history concerns the next structure. A rectangular building approximately 25 feet by 35 feet is labeled "Being built to be Presby'n Church. 15 feet to the eaves." This building, in the late 1890's, was moved two and one half blocks north to the corner of Main and Ninth Streets and became the core of the present First Presbyterian Church. The last structure in this block of Main Street was the residence of Dr. J.S. Saunders. View the original at the Briscoe Center website. The first differences one notices are the names of the streets. Main, Center, and Chestnut are the same as we know them today. The differences come with the streets running east and west. Evidently the system of giving streets numbers had not yet come into being. First Street was Owl Street. Second Street was Elk (how many elk have you ever seen in Fannin County?). Today Oak Street runs north and south in the eastern section of the city. In 1885 Oak Street was what we today call Third Street. Fourth Street/ Sam Rayburn Drive was State. Fifth Street which occasionally carried the label "Toney Avenue" was the called Front Street. Perhaps the north side of the courthouse was considered to be the front, thus the name. Sixth Street was North Street and Seventh Street was referred to as Mason Street. This last label probably comes from the fact that Constantine Lodge #13 once had its lodge hall on the corner of Main and Seventh Streets where First Christian Church is now located. The map labels the structures around the square by the type of business they contained rather than specific business names. However, ads from newspapers of the period plus old photographs from the Museum's photo archives allow us to make some educated guesses about specific business locations. There are some surprises. Let's start a little walking tour at the east end of the north side of the square where we'll look at some of the good's offered by Russell's General Merchandise stores all the way from agricultural implements to hats and gloves. A notation indicates that the second floor is a "public hall." The schematics also show a "stage and scenery" at the north end of the second floor, a reference of course to the famous Russell's Opera House. The building is only two stories high. A fire in the late 1890's gutted the building and using the skeleton for a framework the building was restored and a third floor added, the exterior of the building today looks much the same as the restoration. Education has a rich and varied history in Fannin County. For the past several weeks we have taken a look at the beginnings of public education in the area, the influence of private schools, and some of the people who influenced the development of education in the county. There is still much to tell, but as students begin about this time each year to look forward to spring break, I think we too will take a spring break from our examination of area education. There is much interesting and unusual history from the Red River Valley so we'll take time now to examine some of it. In earlier columns we have taken a look at Bonham as seen through the eyes of English visitor Dr. Edward Smith, and we have seen the fond look back by two long time citizens who came with their families in the 1850's, Locke C. Penwell and W.A. Evans. Recently a copy of an 1885 Sanborn insurance map, of Bonham, was given to the Fannin County Museum by Kevin Jaynes. 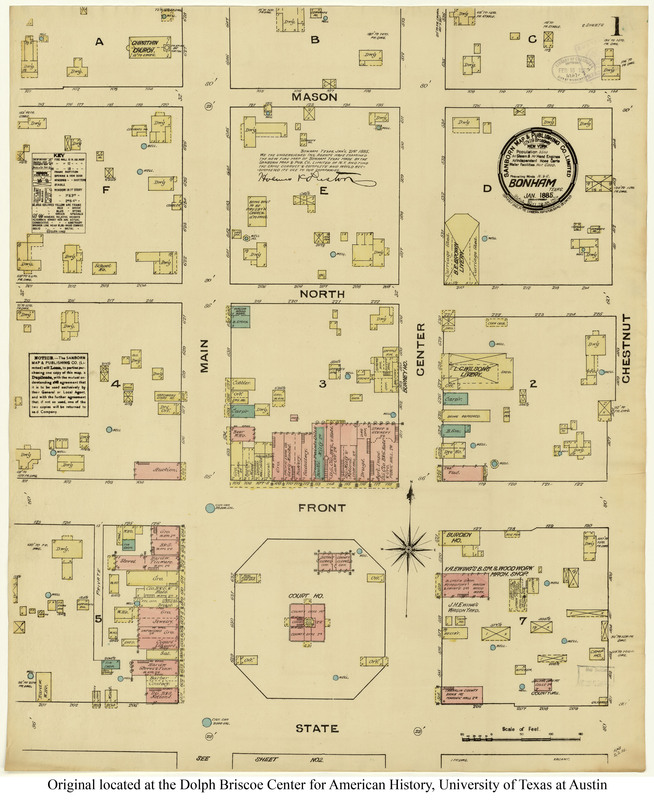 These Sanborn maps, which had their origin in the 1870's were prepared to detail every structure in a town, in their exact location, and what construction materials were used. Several of these maps were prepared on Bonham but this 1885 publication may be the earliest. An insert gives some brief information on the town. The map was published on January 21, 1885 and undoubtedly was prepared over a several week period in 1884. The scale is 1 inch = 50 feet. The structures are drawn to scale and exact shape which gives an interesting perspective to some of the buildings which are still extant. The population of the town was given as 3500, A figure slightly larger than the census figures of 1880. Since this map was prepared for insurance purposes, there is also a notation about the firefighting capabilities of the town. The negative information seems to indicate that there was no organized firefighting capability at the time. It was indicated that there were no steam or handle engines, no independent hose carts, and the "water facilities were not good."